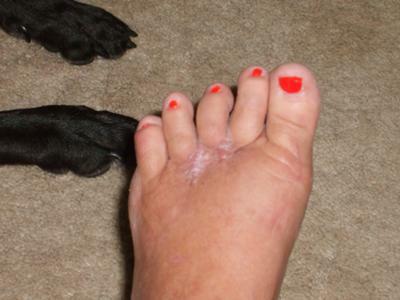 I had surgery for the removal of 2 large neuromas, from the 3rd and 4th toes, over 5 months ago. The incisions opened up, and were re-stiched, in my surgeons office 2 times. It took over 3 months for them to close and heal. I am not diabetic, and I'm in pretty good health. My doctor said not to worry, that this was common. The scars are so gross, I look like Frankenstein. I have had extreme pain and swelling of the foot since the surgery, and can't stay on my feet for extended periods of time. I am in pain all the time and can't even walk our dogs any longer. Is there another procedure to stop the pain, and can these scars be surgically removed? Unless you developed an infection after your surgery, your incisions should have never opened up. Properly sutured skin incisions do not just open. So the notion that what you went through was common is ridiculous. When foot surgery is properly performed the patient should notice improvement on a weekly basis. Every one heals at a different rate based on a broad number of factors, so it is impossible to predict the exact day the operated foot will no longer hurt. So what I tell my patients is to ask themselves, is my foot feeling any better than it did last week? If the answer is yes and continues that way week after week, then the patient is doing fine. When you have reached a point where there is no continuing improvement then you have a problem. In very broad terms, since I do not have the luxury of actually examining you, it sounds like you have a problem. At five months post op you should be feeling much better, if not perfect, at this point. Ugly scars in themselves generally do not cause pain. They may be unsightly but they can be re-excised and sewn back together leaving a nicer incision. Based on your narrative it sounds like you are having a lot of pain which is not normal. The most common cause of pain in these cases is either incomplete removal of the neuroma or a misdiagnosis meaning there never was a neuroma. I am in no position to determine which is the case but your foot needs to be examined by another foot surgeon. Have a qualified specialist look at your foot to determine where the problem is coming from. If you are in as much pain as you state it would be my "guess" that you are going to need further surgery.